Gear4 AirZone Series 1 review | What Hi-Fi? As the AirZone Series 1 shows, Gear4 knows its way around an iPod accessory. 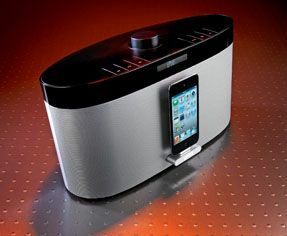 This, though, is its first wireless speaker dock and, at £200, it’s one of the most affordable Apple AirPlay speaker docks around. What’s more, not content with having Made for iPod and iPhone certification, the AirZone Series 1 gets the full thumbs up from Apple for docking with an iPad, too. That little dock will happily hold up any iOS device and charge them in to the bargain. And don't forget that AirPlay allows you to stream directly from iTunes on your computer. If you want to connect other portables, you'll also find a 3.5mm auxiliary input, though there’s no USB connection for charging. There’s even an FM radio. Quite a package, then – and while the styling won’t have passers by stopping in their tracks, it’s smartly understated with a compact footprint and feels built to last. The remote control doesn’t have quite the same cutting-edge appeal, being the familiar credit-card style, but it does the job. Getting Apple AirPlay up and running requires a brief set-up procedure but our experience with this speaker dock was painless. There's a small but clear display: scroll through the menus to sniff out the wireless networks in range and enter your password. AirZone remembered our details. AirPlay has its foibles – the technology isn’t faultless when it comes to holding a connection, finding devices and such – but in this test the AirZone was solid. It's no room-shaker – you'll do well to disturb the neighbours –but there’s a level of refinement you don’t always find at this price. Vocals on The Temper Trap's Sweet Disposition sound clean and clear, while the level of detail recovered is admirable. Something chunkier, such as Drake’s Headlines shows that bass won’t rattle your fillings but what’s lacking in depth is made up with agility and integration. The FM tuner works nicely, too, the natural tonal balance of the AirZone Series 1 working especially well with talk radio, and the tuner proving relatively strong when seeking out stations. Purists will prefer results from a docked iDevice over AirPlay, which slices a layer of detail from playback. Again, though, that’s an issue not with this speaker dock, but the wireless technology itself. We don’t expect too much from a speaker of this size, price and functionality. Provided you value AirPlay in particular, this is a fine performance-per-pound product.